If “On A Night Like This”, the first single from Planet Waves, was an under-achiever on the pop charts, the second “Something There is About You” was an absolute and total dud. It peaked at #107 on the charts, indicating that no one anywhere was interested in this as a single. It is the earliest Dylan single that does not have its own Wikipedia entry. I mean, even “Wigwam” has a Wikipedia entry! That’s pretty damning. 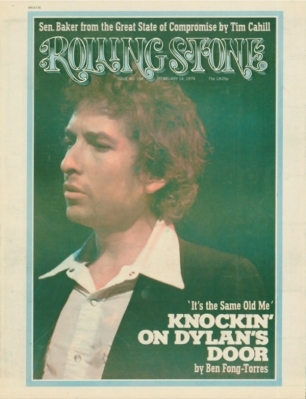 Dylan seemed to believe in the song – he played it twenty-five times (out of forty shows) on the 1974 tour, but then only once since that time. I think he may have given up on it. It doesn’t show up on Before the Flood. He probably had good reason to quit on it. This is one of those songs that doesn’t really ever catch in my head. I like the guitar just fine, but it’s a bit too long (almost 5:00) to be a good pop song considering how one-note it is. It’s too unvarying to hold my attention for so long, and I actually think that it is one of the least interesting songs on Planet Waves. There are good lyrics here – the first line, “Something there is about you that strikes a match in me”, is great, and the whole second verse about Duluth holds a lot of promise. It just never amounts to very much. What I find most interesting about this as a single is that it had to have been chosen over “You Angel You”, which is almost the quintessential pop song (2:54, a love song, simple and repetitive). 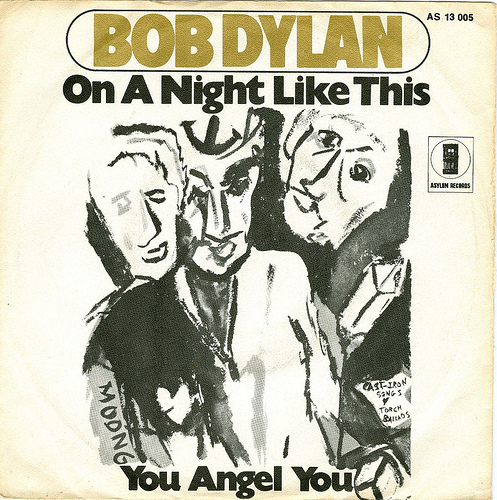 Dylan seems to have hated “You Angel You” though – he has only played it live twice (both in 1990), and he later claimed it had “dummy lyrics”. Too bad, I much prefer it to “Something There is About You”. Of course, “Forever Young” also would’ve made a better second single from this album as well. Actually, most of the album would have been better, and I think that #107 sort of indicates that. Seriously, I can’t even find a decent cover to link to here…. The first single from Planet Waves, “On a Night Like This”, seems to tell the story of where Bob Dylan was with the hit parade in 1974. Despite the fact that his tour was sold out, and despite the fact that Planet Waves was his first album to hit #1 on the sales chart, both of the singles died. “On a Night Like This” only peaked at #44 on the hit parade. Although Dylan had had a semi-hit in 1973 with “Knockin’ on Heaven’s Door” (peaking at #12), he hadn’t had a top ten single since 1969 (“Lay Lady Lay” – #7). While he would have two songs in the Top 40 Chart in 1975, and another in 1979, he would never have another Top 40 hit after that. We are truly nearing the end of Bob Dylan on the pop charts. I have to say, it’s sort of hard to see why with this. “On a Night Like This”, which leads off his most successful album to date, is a commercial pop hit if there ever was going to be one. The lyrics don’t add up to much other than romance, but the song is infectious, singable, and danceable. What more could you ask for in a pop song? This isn’t likely going to be anyone’s favourite Dylan song (and it may not even be the best thing from the album), but it is fun and frothy. It’s hard to imagine people actively disliking it. I suppose that isn’t what anyone was looking for from Dylan at this point in his career. Dylan will be an album guy from here on in, even though he will release dozens of additional singles, must won’t go anywhere. The B-side of “You Angel You” actually probably makes this even twice as poppy. Here’s Los Lobos with a nice cover, including a second verse sung in Spanish. Just try to hate it. You can’t! 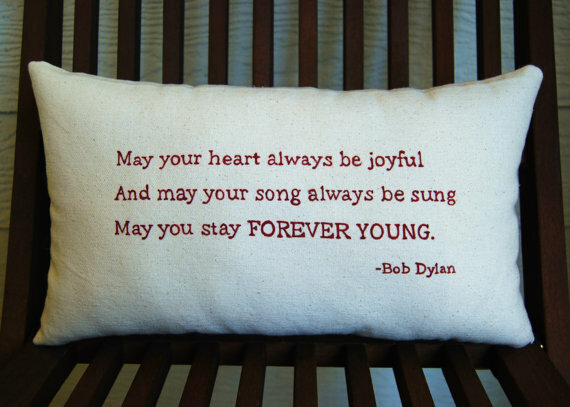 “Forever Young” was not a Bob Dylan single (except, it seems, maybe in Germany), but it is one of his most famous songs. Planet Waves includes two versions of it – one at the end of side one and the other at the beginning of side two, or back-to-back on the CD that I’m listening to at the moment. The latter is technically titled “Forever Young (Continued)”, although it doesn’t display that way on my car stereo. I’m still listening to Planet Waves, so I’m a bit torn about which is the superior version (leaning towards the second), but I am fascinated by the longevity of this song. It’s the most epigrammatic of all Dylan’s songs. Need proof? Just head on over to Etsy and search on homemade “Forever Young” products for sale. Samplers, pillows, plaques, paintings – you name it, you can get it all on Etsy! In 2008 Dylan will even release a children’s book based on the song, but that would be skipping ahead. The other thing that I learned today is that the Rod Stewart song of the same name, general tone and tune resulted in a settlement between Stewart and Dylan, with Stewart forking over part of the royalties to Dylan. I guess he has a good lawyer. Here’s Rod. Don’t worry that it’s lousy, I’m sure Bob is getting a 1/4 of a cent every time someone watches this on YouTube. I spent a fair amount of misdirected energy this week on Writings and Drawings, Bob Dylan’s second book. I looked for it in various places, considered buying it, considered not buying it, finally asked myself if we might not just have a copy in the University library (we do, of course), then checked it out only to find that I essentially already own it. My first instinct on plucking it from the shelf was “Boy, this looks a lot like the Complete Lyrics book that I bought in 1985, even down to the fonts”. A check of that latter book reveals what I think I had never noticed before: a notice on the front claiming “Includes All of Writings and Drawings plus 120 new writings”. So there you go. 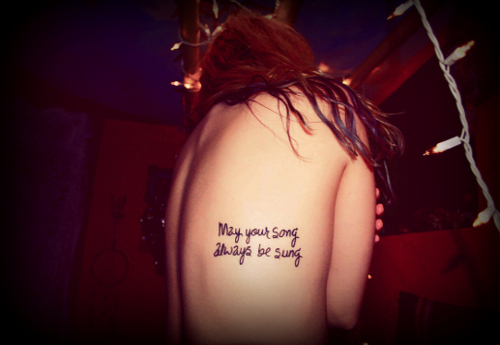 The “writings” in Writings and Drawings are mostly lyrics, arranged by album from Bob Dylan up to New Morning. The value of a book like this one would have been, in the pre-internet days, the ability to avoid wearing out an album if you were trying to learn one of his longer or more complex songs, and the fact that the book contains a large amount of unrecorded songs. From the Bob Dylan section, for instance, there are the two originals from that album (“Talking New York” and “Song to Woody”) and eighteen unreleased songs (some of which would have been circulating on bootlegs during this time frame). Similarly, Freewheelin’ has all the songs from the album plus sixteen other things. The notes are a lengthy statement of Dylan’s aesthetic (whether or not he’s putting us on is another question entirely), in which ugliness and authenticity matter much more than beauty, until he is won over by her voice (“the bars between us busted down”). The other half of the title is “Drawings”, but it is far, far less than half of the book. There are a few dozen drawings in the book – mostly pen sketches, and not much more than doodles. At this time Dylan seemed to be drawing a lot from life – men on park benches in New York, and so on. His drawings are rushed, and he puts very little vitality into them. They are free from cross-hatching or shading, just simple line drawings. Some are semi-abstract doodles (next to “Ballad of a Thin Man”, for instance) and some are highly literal (“This Wheel’s On Fire”). None of them show anything more than a rudimentary talent, which is probably not surprising if you’d looked at the painting he did for the cover of Self Portrait. Dylan will turn increasingly towards the visual arts in the years to come – I took six more books of paintings and drawings out of the library yesterday with the hopes that no one will recall them during the year. It’s not an area that I think he ever got really good at. In the interests of writing something about each and every Dylan single, I have to return to his cover of “A Fool Such As I”, which Columbia released against his wishes as the only single from Dylan. Written in 1952, this was a hit for Hank Snow when Dylan was young, and that is quite possibly where Dylan would have first heard it. Of course, it was a huge hit for Elvis in 1959, so he could not have possibly been unaware of that version. He recorded a sort of lame version of the song as part of The Basement Tapes (which can be found on A Tree With Roots), and then again in April 1969 as part of the recording for Nashville Skyline, before Columbia tossed it onto Dylan four years later. This is a smooth, poppy, over-produced version of Dylan with horns and back-up singers. It would be a good version of the song for someone, but that someone is not Bob Dylan. In some ways it anticipates his work from the late-1970s and even mid-1980s. That’s not necessarily a good thing. 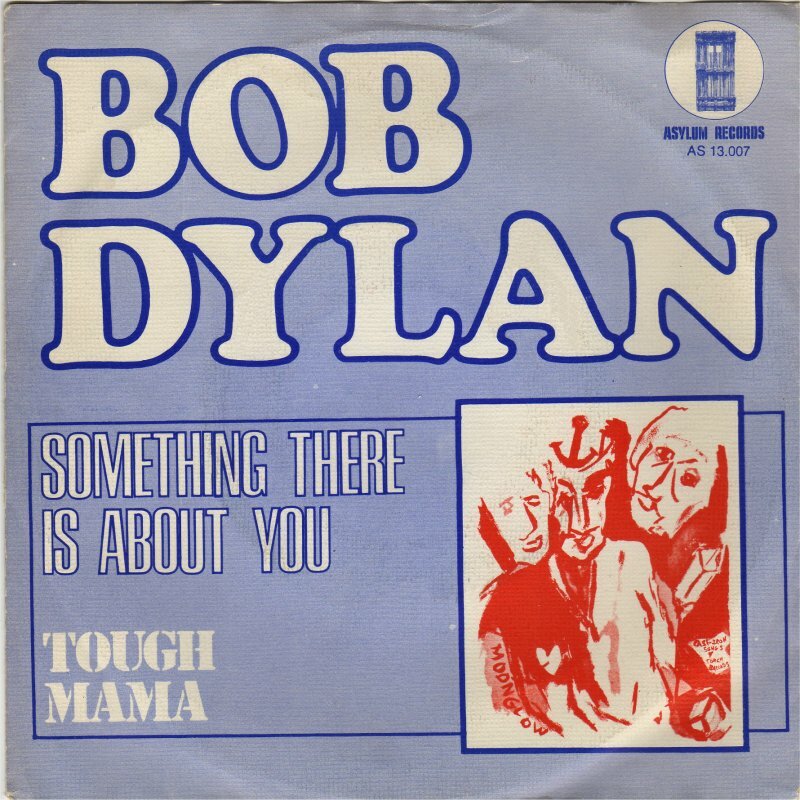 In Europe, Dylan was released as Dylan – A Fool Such As I, which probably accurately reflected Dylan’s attitude for not locking down his rights better and allowing his former label to abuse him as it did by putting this out. The song peaked at number fifty-five on the US charts. That was probably higher than I would have guessed. Even the sleeve for the single was hideous. “Lily of the Valley” is also a pretty cruel joke a b-side. Let’s try to focus for a minute on the positive. I sort of like the cover art. 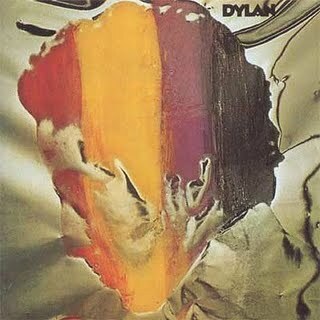 I actually don’t like the covers to most of Dylan’s albums (looking at them all right now, I would almost amend that to say that I don’t like any of his album covers), but this one is kind of goofily above average for a Dylan cover. After that, I think I’m done. Dylan is an album that I had never listened to before this week, and it is one that I may never listen to again, in all honesty. I’ll note that AllMusic.com gives it one star out of five (even Self Portrait got two stars), a ranking that is only matched by 1989’s Dylan and The Dead (the album that ended my initial love affair with Dylan a quarter century ago). I’m guessing that AllMusic doesn’t give it out scores below one star? This is not just a bad album, but it is a legendarily bad album. Perhaps even a purposefully bad album. Released in mid-November, six weeks before Planet Waves, the album was packaged by Columbia out of spite. Dylan had signed with Asylum Records earlier in the year (he will release two albums with them in 1974 before going back to Columbia) and they literally put out an album in an attempt to thwart the sales of the other album. That is pretty incredible if you stop for a moment to think about it. I have to say, I have never paid that much attention to musicians who protest their record labels, from Prince to the Dixie Chicks. I assume that they probably have some legitimate issues, but I never know what they are, exactly, and I have never really cared enough to follow it. I do have to say, though, that when a record company releases a collection of bad recordings of one of their major stars just in an effort to hurt that person, well, maybe record companies are as awful as they’re depicted as being. Almost all of the material on Dylan was recorded for New Morning, although two of the songs date from Self-Portrait. None are originals, and none of them are any good. Many of them are songs that Dylan was recording just to experiment with studio set-up – practice material, essentially. Everything was three or four years old at the time and Dylan had made a deliberate choice to bury it all. Notably, when he came back to Columbia this wasn’t released on CD, though it is included on the Complete Album Collection. Most of the material is kind of disastrous. 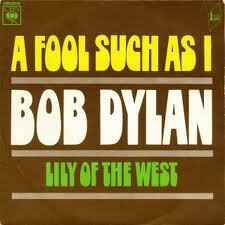 “Lily of the West” is not awful – that is, until the back-up singers chime in. If you stripped them out this was be an inoffensive number. Not important or memorable, just not awful. “Can’t Help Falling in Love” is just dreadful. Nothing should be said about this song. “The Ballad of Ira Hayes” is also pretty bad. I kept trying to like this. I have a nice version of this by Peter La Farge on The Best of Broadside. This does not compare to that. “Mr. Bojangles” actually, for a very short moment, sounded to me like a Dylan song once this week. Just the sadness, the circus, something about it. Then it went away and I’ve never managed to get it back. Pretty awful. Joni Mitchell’s “Big Yellow Taxi” is one of those frequently covered songs that never sound as good as when Mitchell sings it, so what’s the point? “A Fool Such As I” and “Spanish is the Loving Tongue” both add up to nothing. There are two songs that I don’t despise here. “Mary Ann” sounds like a rehearsal song. It’s not a bad traditional song. The guitar part is nice, the back-up singers aren’t terrible. It’s probably the best thing here. The other is “Sarah Jane”. My wife thinks that this alternately sounds like something that The Partridge Family would’ve recorded, or that the Muppets should perform (with all the “La la la la las”). I think that this song is just so derangedly goofy that I sort of have to like it. I like to picture Dylan dressed in an Elvis jumpsuit performing this in Las Vegas. Really, this album is so bad, and the Pat Garrett & Billy the Kid soundtrack is so thin, that I almost skipped ahead to 1974 early today. I was able to restrain myself, but I’ve had Dylan playing in my office all afternoon I am about to lose my mind.